One of my friends was telling me a story about his 4-year old son. They were at a store and my friend was looking through the racks of clothes when his son kept calling his name. Of course my mind is always on the subject of health, fitness, and feeling good and I realized that my friend’s 4 year old son was actually quite smart. He was aware that his dad wasn’t really paying attention to him even though he responded to him. The health and fitness industry can be crazy to navigate. I mean it’s hard to stay on top of the latest fads, contraptions, and research. You watch an infomercial and would swear that just by ordering the pill or machine… you’d see results. We want the results of being healthy, right? It’s one of the reasons that when I started as a trainer, I wanted to do things differently. I don’t care about the fads and I don’t bother you with them either. In fact, many clients that we work with feel quite the opposite. They’re often surprised at just what their bodies can do! At Personal Training Institute, we appreciate what your body can do! We try to get you to see it too on your journey with us. Of course, we’ll also be pushing your body to do just a little more and fuel it just a little better. We want to help you appreciate what you can do and see your potential, to be part of your journey. We have several open slots this week for what we call chit chats. It’s a 30-minute block of time where we can meet, talk, and chit chat about you. Of course, our staff will answer any questions you have about what we do or how we can help you. There’s no pressure or obligation. Just a chat. 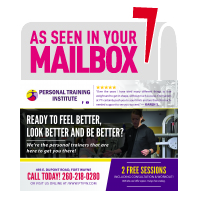 If you’d like to schedule your session please give us a call at 260-338-2022. Once it’s scheduled, cross it off your To Do list and feel good about your accomplishment! Josh you always write so nicely, I enjoy reading what you write. Wish I had a brain that works like yours. Keep up the great work!